Review: Cal Ormond – wanted fugitive – continues to evade police and the criminals who want him dead in Gabrielle Lord’s 11th book in the Conspiracy 365 series, November. Sixteen-year-old Cal is able to make minimal progress in his ultimate quest – to uncover the secrets behind the Ormond Singularity in November. However, great progress is made in other areas. The mystery surrounding Cal’s “look alike,” Ryan Spencer is revealed as Ryan ends up saving Cal’s life in one of the countless times he’s near arrest or death. Plus, Eric Blair, the man Cal’s been trying to reach ever since this entire mystery began, finally meets face to face with him. Eric was the last person to be with Cal’s father before the mysterious illness took his life, and Cal quickly realizes that Eric is a greater part of the mystery than he had originally thought. Plus, the subplot involving Winter’s parents is also brought to a head as she finally discovers exactly how her parents died and what role Sligo had in their death. However, Winter may never be able to tell Cal. Somehow, Cal must find a way to Ireland and uncover the true mystery behind the Ormond Singularity. Can he do it before it’s too late? 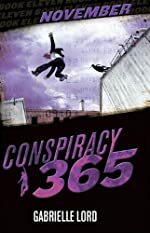 Everything will finally come to a much-awaited conclusion in the concluding installment of the Conspiracy 365 series – December! Gabrielle Lord continues to blend intrigue, suspense, and compassion in November. This is certainly not a series to start midstream – readers must begin with January in order to fully understand the predicament that faces Cal. However, no reader will be disappointed. These eleven books have been the most exciting and entertaining young adult books I’ve read in a long time. I can barely contain my excitement to begin December! It’s been an exhilarating year as I’ve plowed through book after book in the Conspiracy 365 series. As the holidays approach, consider starting your middle school or early high school reader on a quest they will never forget by opening their eyes to January! But, be prepared . . . . they will not be satisfied until they’ve read all twelve books! Hats off to Gabrielle Lord for developing such an interesting plot that she’s able to stretch it out over 12 books in 12 months – never once sacrificing character development, plot or style. We would like to thank Kane Miller for providing a copy of November for this review. Have you read November? How would you rate it?